We have all been guilty of uttering the phrase, "Let me know if I can do anything" when a friend or loved one is sick, has an emergency, or other situation. We believe these words will absolve us of our duty to actually take action. After all, if our friend or family really needed something they would tell us, wouldn't they? The reality is that our friends and family usually do not want to trouble us. Sure, we all know that one needy person who ALWAYS needs something and isn't ashamed to ask no matter how trivial. However, the majority of us have too much pride to admit that we cannot do everything on our own or be our own support system. The idea for this post weighed on my heart as I was typing the words "let me know what I can do" to my sister. Her daughter was in the hospital for three weeks before prematurely giving birth to triplets. Of all people, I should be proactive in a situation as this. Waiting around to find out if I can do something is wrong. I was in a similar situation as my niece when our second son decided to come thirteen weeks early. After three long, miserable weeks in the hospital he was born. Then he had a long hospital stay. There are other members of my family who have declining health. They spend much time at home, doctors offices, or in the hospital. Living in a different state is not an excuse for me. There is always something I can do for others who are experiencing trials. We need to reword our intention. Instead of saying, "Let me know what I can do", we should state WHAT we are going to do and WHEN. Sure, sometimes they won't be available. Leave a message and let your loved one know what time they may call you back. The fact that you thought to call will brighten their day. When I was in the hospital for three weeks trying to grow a bigger baby I received many cards. Each one was appreciated. Knowing that people took the time to write out sentiments was very encouraging. A visit to a person who is shut in, in the nursing home, or hospital may be the only contact they have with non caregivers that day. You do not have carry on a conversation the entire time. Sometimes all you need is a friend to be present during a difficult experience. Offering to take them to an appointment or being there during a treatment means more than you will ever know. The offer can be presented as, "I am going to take you to your next treatment. What day is that?" Even during life's difficulties we must eat. My husband's coworkers and our church family made sure there was food for my husband and son. At least three nights a week during my stay and after the baby was born someone provided a meal. My husband was able to concentrate on working, visiting the hospital, and taking care of our 8 year old. Meals do not have to be elaborate. I have ordered takeout for friends that are not local. Another option is to send a gift card. All we need to do is call our friend and say, "I am bringing over food tomorrow afternoon. What time works for you?" Even though the subject can be uncomfortable, money is usually needed and appreciated. Instead of spending it on flowers give your friend or family member the cash instead. When there is an illness or emergency families use a lot of fuel making many trips to hospitals and doctor's offices. Those miles add up to a lot of fuel. Cash can come in handy. During this time people also depend on fast meals. A roll of quarters for vending machines is especially useful for the mom or dad who is camped out at the hospital waiting for NICU visiting hours. Instead of asking if they need money present it in a card or hand the cash to them saying, "I want you to have this." The simplest but most important thing you can offer a person who is sick or going through difficulties is prayer. Pray with them and pray for them. Pray often. Name that person and their situation in your prayers. We know that God is listening. James 5:16 The effective prayer of a righteous man can accomplish much. Sometimes we all need a reminder that good intentions don't get the job done. I know that I do. Do you know what is in your pantry? I thought I did. My main pantry is tall, dark, and deep. Things get shoved to the back. I also have a cabinet to use for the overspill. There never seems to be much to serve the family to eat but there is a lot of stuff in there. I decided to clean out the pantry. I employed the help of my five year old son. He helped me take everything out of the cabinets. There were tall towers of cans that could hurt a person if they tumbled. He asked me several times, "What is THAT? ", as we pulled out home canned concoctions. He had a ball while I tried to sort and categorize the mess. Next, I checked the expiration date on all the food. I buy these fruit cups for my father in law when he comes to visit. Apparently, I forget that there are some shoved in the back of the cabinet and continue to buy more several times a year. All of these were expired so I threw them away. The homemade canned items were all BAD. Some were more than a couple of years old and had strange colors. These all had to go. Finally, I put everything back in the pantry and cabinet. I put things back by category and corralled some of the small items in bins. Shelves were also useful for the bread and bottom shelf of the tall pantry. Look at that throw away picture. I could not believe I had that much food in my pantry that went to waste. In the future I hope to be able to see what is in my cabinets and check them before I go shopping. How about you? When was the last time you cleaned out your food pantry? We have many electronics with many cords now a days. Just to be sure we keep a charge we have have extra cords and chargers. 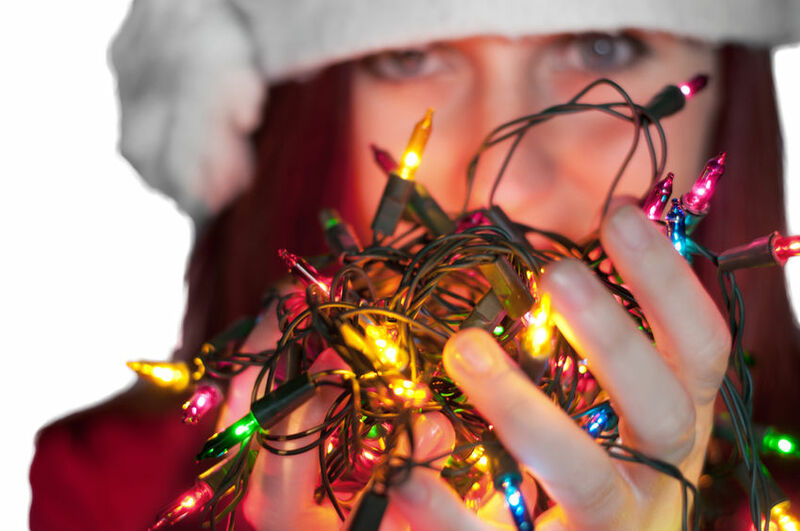 Do you have a tangled web of cords like me? What I mess I had! I decided to do something about the craziness in our electronics drawers. First I thought about a way to tame those cords. Pipe cleaners are the most economical way I thought of to deal with cords. Go raid your kid's art supplies or pick some pick cleaners up from Wal-Mart or Target. Then cut them in half. Now use them to keep those cords from coming undone. Next, gather up all of your cords. Get them from the cars, the bedrooms, and wherever you have stashed cords and chargers for all of your electronics. From now on you are going to keep all of them that are not in use in one place. Separate the cords and electronics by type. My categories are micro USB, mini USB, and ones attached to chargers, If you have cords that go to certain pieces of electronics put those in a sandwich bag and label them. If there are cords that do not belong to any of these groups then put those in a bag. If you haven't used them after 6 months and cannot find the equipment they go to then you can get rid of them. Now, roll up your cords and put the pipe cleaner around them to hold them in place. When you remove the pipe cleaner put it back in the drawer so that you can always find them. Finally, label bins and put the cords in the appropriate place. I also did this with all of the earbuds, headphones, reading book lights, screen cleaners, and openers we have. 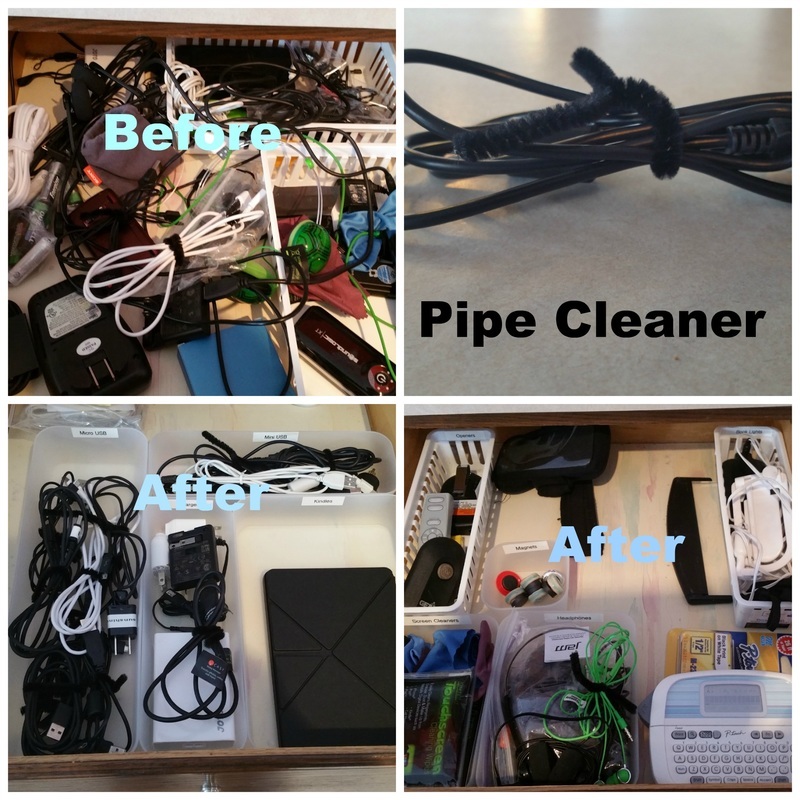 You can also use over the door shoe organizers to organize your electronics. I have several drawers in my kitchen so I use those. If I had enough door or wall space I would hang them up. Work with what you've got! I don't know about you but I feel like I have accomplished something great by getting these electronics and cords under control! Leave a comment below if you enjoyed the results of this challenge. Are you proud of the fact that you have 1200 emails in your inbox? That number shows how important and busy you are, right?! Or, are we just too lazy and "busy" to take care of business and emails? The answer for myself is that I just do not want to bother with all of those emails when they come in. I keep thinking that I will get to it later. Well, later is now! Next, is the fun part. Start deleting those emails in big batches. Delete junk mail, spam, chain mails, email that is no longer pertinent, and other email that you know you do not need anymore. Then, you will want to make folders for important emails that you do not want to trash at this time. Label a folder for pictures, accounts, for each project that you are working on, each person in your family, a folder for stores or coupons if you get those, and any other kind of folder you think you will need. Then move emails to the appropriate folder. Warning! Do not make too many folders. The point of this exercise it to simplify your email and inbox. Also, unsubscribe to emails that you are not reading. I like to get free information and sometimes that requires me to give out my email address. Of course then the marketing emails start coming in. Take a minute to unsubscribe to services you are not taking the time to read or do not add value to your life or business. You can also apply filters so that emails go directly into a folder for you to read later. I put coupon emails in a folder and look at them when I make out my shopping list. This way my inbox is not full of unread email. Last, let's take the time respond to important emails that are not more than a few weeks old. In this day and age if you have not dealt with something in that time frame then it is no longer relevant. Delete the older emails. Your inbox should be relatively empty by now. I know mine is! Please comment below and let me know how your email purge is coming along! Challenge #3 of 29 Days to Life. Simple. Don't you just love office supplies? They are supposed to keep you organized. And the cute and colorful ones can make some of the dreariest tasks seem fun, right? But, these cute supplies can get out of control. Do you have a lot of pens and pencils but have a hard time locating them? 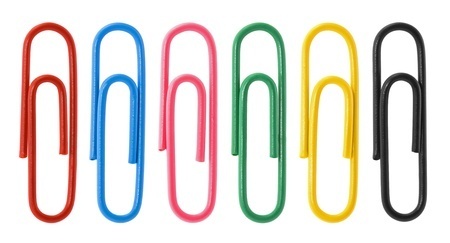 Are there stray paperclips, rubber bands, and other items all around your home? Or, perhaps you are like me and most of the items are in one location. In a jumble. Let's get those office supplies tamed so that you can always put your hands on them when you them. As always, take everything out of your drawers, baskets, or wherever they are. Sort by category. Next, purge your items. None of us need 50 pencils. Even if you are a teacher and tutor a lot of students you do not need that many pens and pencils. Let's pick a good number like 10 or 20. Then, use the same process with paper clips, sharpies, highlighters, rubber bands, letter openers, etc. If you are a lover of school and office supplies the purging step can be difficult. However, think about the tidy space you will have and the time you will save looking for just the right pencil or pen. Last, think about the space you have to store these things. 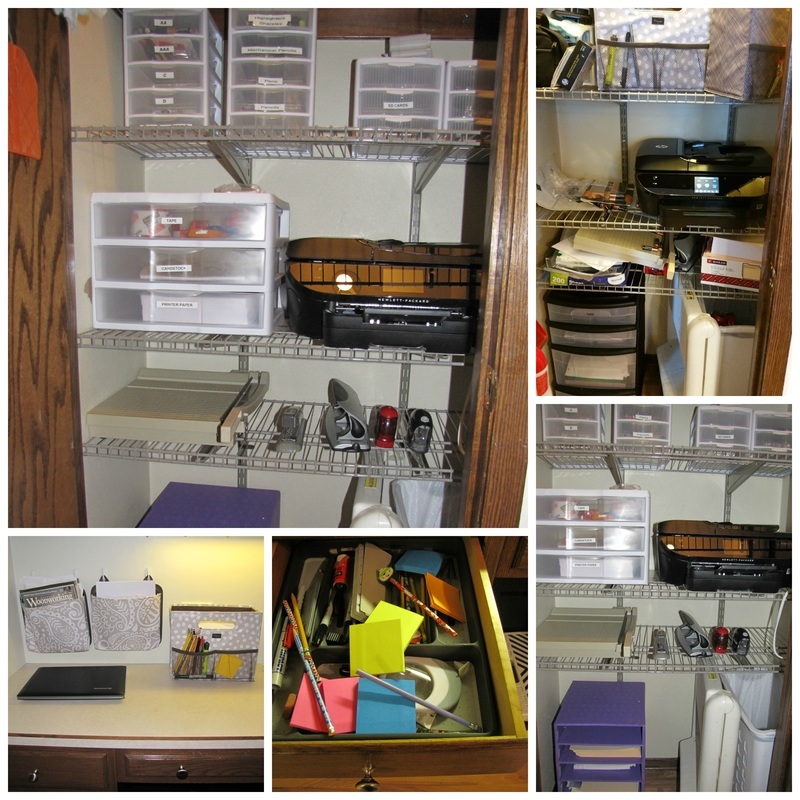 Do you use a desk drawer for office supplies? Purchase a utensil tray to keep your items neat and tidy. Do you use a closet like me? Put the items in plastic drawers. By the way, I cannot leave all the items in a drawer because it becomes a big, hot mess. Now you may donate all of the extra supplies you had to an organization that needs them. Schools, churches, and non-profits all enjoy getting your cast off office supplies. I hope this post inspires you to declutter and simplify other parts of your life. Stay tuned for more tips of 29 days to Life. Simple. If these posts have been helpful to you please leave a comment below. Day 2 of 29 Days to Life. Simple. Is your linen closet as wacky as mine? People (the little ones) get things out and shove things back in. Sometimes it appears that the contents of my linen closet have been involved in a tornado. Well, today we will fix that problem. We are going to simplify your linen closet so that you do not dread opening that door! First, we are going to do what we did yesterday. Take EVERYTHING out of the closet. Everything including the blood pressure cuff and asthma huffer thingy that was in a plastic container in my closet. Next, sort your items and put them in categories. My catergories are queen size sheets, twin xl sheets, blankets, pillow cases (because we have several extra), a sewing kit, table cloths, curtains, and other odds and ends. Now, put your sheet sets together. Can you fold a fitted sheet? I sure can't! But, Martha Stewart is the Queen! Here is a link to her video on how to fold a fitted sheet. Perhaps I can learn to do it correctly! Next, sort through your towels and washcloths. Put the ragged or extra ones in pile. Find the things that don't belong a new home. Great! Now you are ready to put your nicely folded items back in the closet. It helps me to have a designated container for my things. That way nothing gets mixed up and has a better chance of staying folded. Another plus is that you can tell when you have too many of an item. If the container is full then you do not need any more. If you must purchase more of that item then get rid of some. 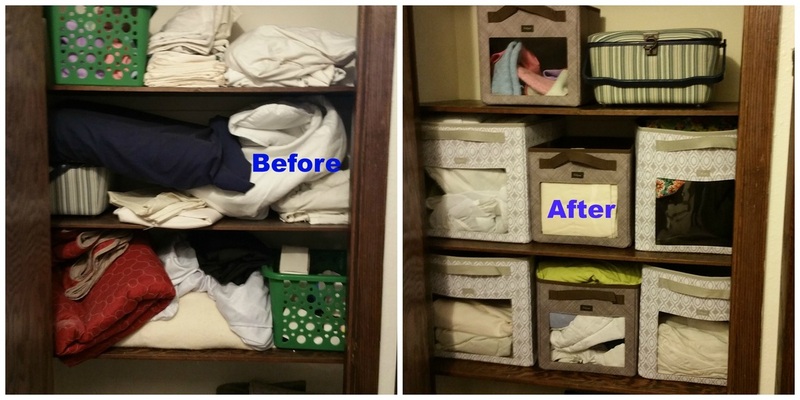 I like to use bins and today I am using 31 bins to organize and simplify my linen closet. I have a friend that is a 31 consultant and I get some great deals. You can also buy bins at Walmart, Target, or anywhere. Just make sure they are large enough for your linens, at least 12x12. Put your bins back in the closet and you are done! This bin system is easy to maintain. Now how about donating those lone sheets and less than stellar towels to the local dog shelter or Humane society. They can always use these type of supplies. Do you need someone there to cheer you on while you are simplifying your closet? Maybe you just want someone to do it for you. Give me a call! I hope you are enjoying my 29 Days to Life. Simple. posts. Please comment below to let me know how you are doing! Challenge 1 of 29 Days to Life. Simple. Hello! Are you READY?! I sure am! 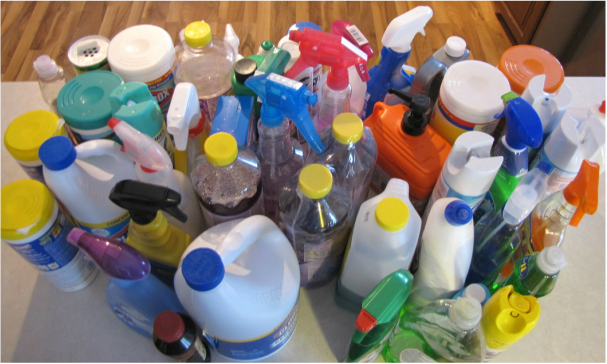 Today is Tame it Tuesday and we are going to simplify our cleaning supplies. ​Go ahead and gather ALL your cleaning products in one place. Get them out of the bathroom cabinets, kitchen cabinets, and all the places you store cleaning products. WOW! 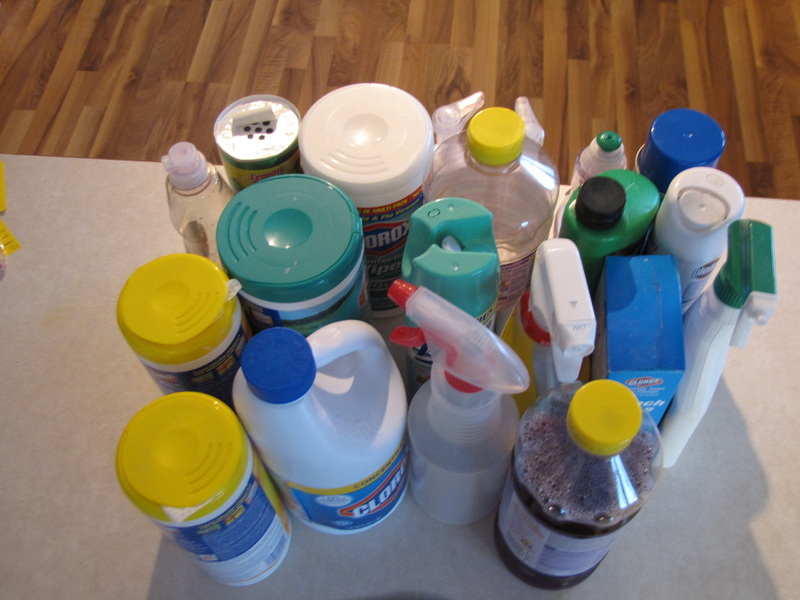 Can you believe that I rounded up 49 bottles of cleaning stuff?!?! You would think that I am a little OCD and need specialized products for my cleaning obsession. However, I really do not enjoy cleaning. I love to organize. But cleaning is not fun. Somehow I have collected all of this junk, I mean cleaning products. I used to use basically one cleaning product, Mr. Clean. I put it in an spray bottle and diluted it. That is what I used to clean everything. I would get compliments on how good my house smelled. That made me happy. I have also invested in several Norwex cleaning cloths and dusters so that I am not using so many chemicals in my home. We like the smell of some cleaners. Our family will probably never be chemical free but we can use fewer harsh cleaners in our home. Today,I realized that I could stock a store with my cleaners. At this time it appears that I have collected several floor cleaners for wood (that need to be used!!! ), different kinds of bathroom cleaners, almost empty bottles of bleach, dried out cleaning wipes, toilet bowl cleaners that do not dissolve, several bottles of Lysol, and the list goes on. I probably had so many bottles that I could not find what I needed and would go out and buy more. What a waste of money and time! Guess what? Today, I got rid of 21 bottles of this stuff. Some were empty. Some were almost gone. Some of the spray bottles do not work. The bottles that were full I shared with a neighbor. If you have too many of one thing like I did then find someone who can use it. A college student would appreciate a half used bottle of cleaner! We have 3 tiny bathrooms so I put a bottle of cleaning wipes, spray disinfectant, and Lysol in each one. The dishwashing liquid, one bottle of floor cleaner, one bottle of dusting spray (that I have replaced with Norwex cloths), glass cleaner, dishwasher detergent, Drano, and a few others went back under the kitchen sink. The hand cleaning soap went back to the master bath. Ahhhhhh. It feels great to purge unneeded items. Now I can actually find what I need under the kitchen sink without having to move things out of the way. How about you? Do you need someone to purge for you? Organized by Sunshine is here to help! Please comment below and let me know how you enjoyed your experience with simplifying cleaning supplies. Are you up to the challenge?! By the way, I realize that I did not start on February 1st for the 29 days. I will make it up to you! Get ﻿Ready for - 29 Days to Life. Simple. I am excited for us to work together in February to declutter and simplify our homes, offices, and our lives! Stay tuned for tasks and tips to make this a simple process for all of us! Also, share the message with your friends and have fun together! 3 Tips for a Simple Thanksgiving! How can it be Thanksgiving already?! Time flies when you are having fun. Or raising kids. Or working. Thanksgiving used to be one of my favorite holidays. Fall is a great time of year. In the south we could still spend time outside if our large extended family gathering got the best of you. I never knew how much I would miss everyone talking over each other and trying to find somewhere to sit. The food our grandmothers and aunts prepared was wonderful and it was the only time of year we saw much of our family. Many of those special people are gone now, while some of us have moved far away, and the traditions and gatherings are disappearing. Since we have moved to the Midwest I dread Thanksgiving. It is difficult for me to get into the mood to cook a large festive meal for the four of us. First of all I am not a great cook. Also, there are no cousins or mother in law here to talk and laugh with as I clean up the mess of my kitchen. But, this year I am going to try to do a better job of creating great memories for my family. I just have to remind myself that the holiday does not have to be an elaborate affair. Below are a few tips for a simple Thanksgiving. The first thing on my Thanksgiving list is a simple menu. To avoid having too many leftovers I am only going to cook a ham or turkey but not both. My family tires of leftovers after a few days. We just do not have to have that much food prepared for a family of four. If you you do not want to have to cook both meats then just say No!...lol You can cook one at Thanksgiving and the other at Christmas. 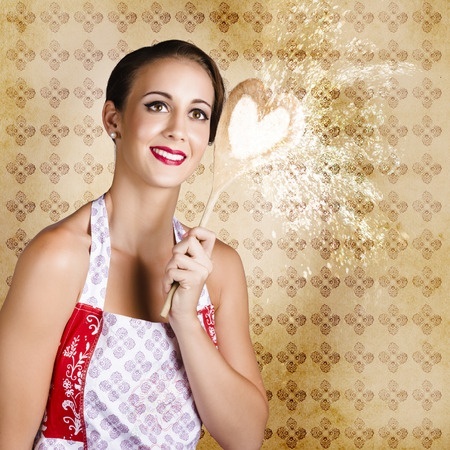 If you enjoy all the cooking and baking then go for it! I also ask for everyone to tell me their favorite dish. That way they can help prepare it and are more likely to eat it. If you do not enjoy decorating for the holidays have the kids put some pinecones in a glass jar or bowl. Put a couple of tiny pumpkins in the mix. Voila. When Christmas comes around change them out for bright, shiny glass ornaments. Have the your children trace their hands to make turkeys and color them. You can also use kraft paper for a tablecloth. Have people sign their names, write what they are thankful for, or draw pictures. You will be surprised how long this can keep children and adults amused. Do you have fond memories of family traditions? This year mix things up so that everyone is included in the festivities. -Have the men do the dishes. I am instituting a new family tradition. The boys and their dad are going to clean up. Sounds like a plan to me! 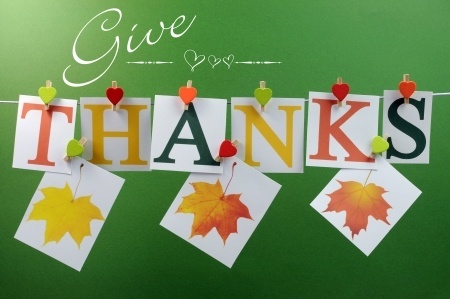 -Invite another family to share your Thanksgiving meal who does not have family nearby. I know many families who do this as we have in the past. Or, share dessert. A friend of mine may come over after our meal while my husband and older son are out hunting. -Play a board game. Scrabble and Mexican Train are our family favorites. -Do a craft with the kids. Make Christmas ornaments or have the smaller ones color. The bottom line is to have a simple Thanksgiving. Make sure that everyone is having fun, including youself. I would love to hear about your Simple Thanksgiving plans! Please, NO Apples for the Teacher! It is time for Spring Break and before you know it the kiddos will be out of school for the summer. We start thinking about gifts to show teachers how much we appreciate them. You peruse Pinterest to get inspired to make the cutest gift the teacher has ever received. Well, I am here to tell you to JUST SAY NO to "teacher gifts". We are all guilty of it at some point but it has to stop. 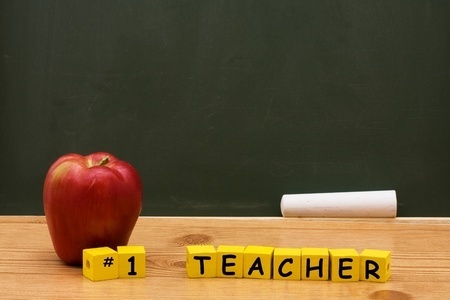 Your teachers really don't want another mug that says #1 Teacher. They REALLY don't want another picture frame handcrafted from pencils. No more plaques with pictures of apples. Those melted crayon art canvases are kind of strange. They really do not need any more apple jars. Cut it out with the cutesy rulers and clipboards! Also, just as a reminder, an 8x10 picture of your child is not appropriate. The main reason to forget about the cutesy gifts is to help your teacher control clutter in their home. This past Christmas break I helped my mother in law do some decluttering. She taught for many years and had many beloved students. We collected over 50 "teacher" mugs, that many candles, and some strange body sprays to take to Goodwill. We also got rid of some "teachery" Christmas ornaments and jewelry boxes. This stuff had been taking up real estate in her home for years. We are not even mentioning all of the mini school pictures of her favorite students. She just didn't know what to do with all of these gifts. And this was just a drop in the bucket of what she has received over the years. Let's do the math. If a teacher has 20 students a year and teaches for just 15 years they could receive 300 gifts during their career. That is a low estimate. If each of the 20 students spent $10 then the class as a whole spent $200. What if everyone gave a couple of dollars for a gift card instead? This scenario would be less expensive for the families and the teacher gets something that is useful. I know that teachers appreciate your thinking about them. But, wouldn't you much rather give teachers something they will enjoy? How about a gift certificate to Starbucks or a restaurant? Some teachers like to have their nails done. Male teachers would probably like a gift card to a sporting goods store. Hey, how about a gift certificate for an organizing session to get rid of all those teacher gifts in the closet...lol! Or, just save your money and tell the teacher how much you appreciate their hard work. I would love to hear from some teachers about the gifts they would like to receive. Please leave your comments below. You know the purple dinosaur song. It is in your head now for the rest of the day...haha. As soon as the Christmas decorations are up I am thinking about taking them down. I just do not enjoy the mess the tree makes or trying to keep the dogs and kids away from the tree and stockings. By the way, those are my only Christmas decorations. I do not want to spend the time or energy creating or storing clutter. Keep it simple. That's my motto. If you enjoy lots of holiday decorations that is great. But, if decorating and cleaning up causes you stress you may want to rethink your decorating scheme. My husband, kids, and I do not spend the holidays at our home. We go "home" to Alabama to see our families. ROLL TIDE. So, I like to get my Christmas things put up before we go. That way I do not have to do it when I get home from our Christmas "vacation". I can concentrate on putting up the kids new pile of loot, I mean toys and gadgets, they got from both sets of grandparents, aunts, uncles, and various well meaning friends. One way I make cleaning up a cinch and make it easier to decorate next year is to put the lights up without them getting tangled. This is simple. I use cardboard from the cardboard boxes where I ordered gifts. Just wrap each strand around a square of cardboard. Then, when you go to get them out next year the task of putting the lights on the tree will be easy to accomplish. I know some people put them back in the box they came in and press each light into the individual spot. With over 900 lights on my tree that is a waste of time. Keep it simple. You can also store your decorations in containers made just for them. Or, make your own out of boxes with dividers made from cardstock. Wrap special decorations in tissue paper. Now that everything is not just thrown in boxes you will be able to find what you want and you do not run the risk of things getting broken. Remember, if something is important or special to us then it should be taken care of. I do not have a lot of knick-knacks or decorations in my home. But, the Christmas ornaments that my children have made are precious to me. I want to make sure they last for years to come. I am sure you do, too. Have a great holiday! I hope you spend time with family and friends doing activities that you enjoy. I know my fourteen hour car ride is going to be so much fun with two kids, a dog, and a husband who wants to beat his best time for this trip. Happy Thanksgiving! If you are doing some Christmas shopping soon I have a simple list for the special people in your life. This simple list only has space for FOUR items! Yes! That's correct. I am pretty sure that your family is a lot like mine. We all have too much. We have too much of everything. And we all get too many presents for Christmas, birthday, and other holidays. I hope you enjoy this short and sweet way to capture wants and needs in a simple way. After all, we have so much already that we should be thankful for. Not just today but every day. Life. Simple. Have you ever stepped on a Lego in the middle of the night? Ask any parent about the pain involved with these little plastic bricks. Have you trampled over your child's favorite happy meal toy in your heavy winter boots? Those cheap things shatter into a million tiny pieces. Even though sometimes I may as well be talking to myself, I have tried to make my children understand the consequences of leaving their toys out everywhere. The bottom line is people get hurt and toys get broken when everything is left on the floor. As any good parent does, you ask your child to clean up their room. When you check on them, your child is playing or just sitting in the chaos. We parents we tend to get very frustrated over the state of our kid's bedrooms. There is stuff everywhere. Since we live in the land of more than plenty, maybe your child just doesn't know where to start. Cleaning a whole room can be overwhelming for children and adults. Below are some tips that can help make cleanup time easier on everyone! 1. Break down the jobs in steps. For example, first ask your child to make up their bed. Then, pick up any clothes in the floor. Next, clean up toys. Continue in this manner with each task. In the beginning have your child check in with you after each task is complete. You can direct them to the next job. 2. Have your child pick up toys by category. First, ask your child to put away all the cars. Next, clean up blocks and then legos. Keep going until all the toys are put away. 3. Use simple systems for storing toys. Bins without lids work great for everyone because there is only one step to putting things away. Dish tubs, inexpensive totes, and laundry baskets from a dollar store make great toy storage. 4. Resist the urge to do it yourself. This is my weakness. Sure, it is faster to take five minutes to clean the room by yourself. But, in order for kids to learn how to clean their rooms they need to be shown how to do it. 5. Make life simple. Cut down the amount of toys your children have and cleaning up will be a snap. I recently went through my four year old son's toys. Does he need 50 hot wheels? I think not. Twenty cars are too many. What about the forty tractors he inherited from his older brother to add to his already large collection? Does your child really need twenty stuffed animals or dolls? I think you know the answer to this rhetorical question. Are there books on the bookshelf that they have outgrown? Give your child a number to guide the downsizing process. Tell them to pick out ten puzzles, five dolls, fifteen small cars, etc. Then get rid of the rest. 6. Donate, sell, or, rotate extras. Do it immediately so that no one gets anything back out of the tubs. If you want to rotate toys put the extras in a storage tote away from children's reach. When you get the other toys out be sure to put the others away. 7. Ask relatives and friends to give experiences instead of things. Kids love to go to the zoo, museums, movies, beach, bouncy house, theme park, ice cream parlor, book store, and the list goes on. I Tunes, Google, and other sites have games, music, and videos for children. Grandparents can buy tickets, gifts certificates, and gift cards for these activities at many retail stores and online. These kinds of presents are like giving parents a gift as well. These tips will help you get a handle on teaching your child to clean their room. Download the coloring chore chart and hang it on your child's wall as a visual reminder. If cleaning your child's room is a daunting task I will be glad to help you out! Give me a call and we will tackle this job together. We can do this in person or by phone and email. Organized by Sunshine is now offering an auction service to declutter and beautify your home! I am excited to announce that I have joined forces with All'asta as an independent consultant. All'asta is Italian for auction. All'asta offers a wonderful product line of home decor and accessories. But the beautiful thing about All'asta is that it centers around a gathering of your friends where you auction your own items and make money. I love it! I found All'asta after trying to consign a few items of my own not long ago. One consignment store requires an appointment with a limit on the number of items you can bring for consignment. But, you can bring more each day. They decide what they will sell and how much you will get for your stuff. Another consignment store only takes certain items and splits the commission with you 60/40. You get the 40. What?! Are you serious?! I thought decluttering and consigning was supposed to be simple. Well, with All'asta it is. 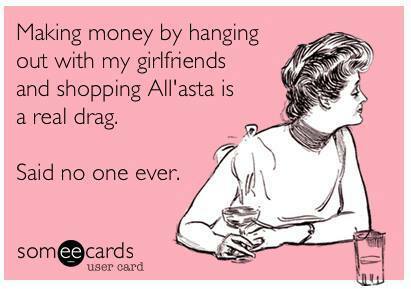 All'asta gatherings are fun and easy. The hostess invites her friends to bring up to three items to auction. The hostess gets to put as many things as she wants in the auction. Everyone makes 50% of what their items sold for. You can use your money to purchase auction items, products from the All'asta collection, or receive a check. How easy is that? All'asta is a great way to part with items that you want to go to a loving home. No one wants to drop off a leather Coach bag at Goodwill. Selling on Facebook and Craigslist can be scary. But, your friend may love the purse and pay your for it! All'asta auctions are open to just about anything. You can sell jewelry, accessories, books, clothes, toys and the list goes on. Right now is a a great time to start saving for your Christmas purchases and simplify your home. How much money do you want to earn at your auction? It is time for school to start again. 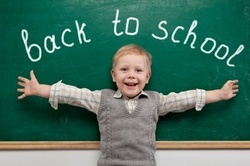 That means back to school shopping which includes school supplies. We received the registration packet for my son who is going into seventh grade along with the dreaded school supply list. Not only do I see major dollar signs but the list is a bit overwhelming. Don't get me wrong. I do not mind purchasing class supplies such as hand sanitizer and tissue. However, the part of the list for everyday learning is a bit much. My son's 7th grade school supply list includes: 7 spiral notebook, 6 folders, 1 composition notebook, 2 one inch binders , 1 pack of loose leaf paper, 2 packs of index cards, 1 pack of colored pencils, 1 highlighter, 1 ruler, 1 pair scissors, 1 box fine tip markers, 24 pencils, Pens- Blue, black, and red, 1 flash drive, and 1 Texas instrument calculator. Students with organization and attention problems (a.k.a most seventh grade boys) can find organizing all of this class material and finding it for the correct class a bit overwhelming. Backpacks are left in lockers at my son's school and the kids carry their books and supplies in their arms during the day. They can go to their locker between classes but have a very short time frame to do so. This means kids carry too much and drop much of it in the hall. When my son was much younger we searched for ways to simplify his school supplies because it was all too much for him (and us) to keep up with. There were lost papers, books and notebooks left at school, papers that were crumbled up in the abyss of his backpack, and notes that never made it home. We took weekly trips back to school hoping that the door was still unlocked so that my son could retrieve what he needed. I have done my research on organizing children and their school work. One of the best books that I have come across is The Organized Student by Donna Goldberg with Jennifer Zwiebel. This book has great suggestions for everyone. Below are are a few tips from this book and some of my own. The most useful advice from The Organized Student for my son was to simplify everything into one binder. You heard that right. Instead of notebooks, composition books, folders, and all that jazz, just get one large binder that zips. Use dividers with pockets and tabs to separate subjects. The pockets within each subject can hold completed homework. Some binders have a small accordion file in the front. Use this area to store graded papers until you get them home, parent and teacher communication, blank loose leaf paper, and even a composition book. Donna Goldberg also recommends using loose paper with reinforced holes. This is great for my son who had a problem with tearing his paper. When they use a single binder for multiple subjects your child only has ONE thing to keep up with! Goldberg mentions that this method does not work for everyone. Binders may not work for left-handed people. There are other options listed in this book and other books for organizing students. The point is to find the simple method that works for your child. 2. Choose a home for your children's backpacks. Put hooks by the door, use a cubby holder, or put the backpacks in a closet. Just pick a spot and have your children start storing the backpacks there. No more running around looking for the backpack as the bus pulls up to the door. 3. The binder and other material immediately go back in the backpack when your child is done with their homework. You will have to drill this into you children and your husband for a very long time but eventually they will do it. 4. Does your child have a hard time picking out clothes in the morning? Or, does he change what you pick for him to wear? This shirt is itchy and another has an annoying tag. Have your child pick out his own clothes for the following week and put them together in a place you have marked for outfits. My my son came up with his own solution to his clothes problem. He wears his clothes to bed. When my son was in second grade he asked if he could wear his school clothes to bed instead of pajamas. Don't judge! This small change has saved us thousands of minutes on school mornings. A smooth morning far outweighs a few wrinkled clothes in my book. 5. A second set of textbooks at home is very helpful for some children. The school custodian will miss you but you can ask the school to supply an extra set of texbooks if they have any. Or, you can purchase many textbooks online. 6. Homework is done immediately. I am a mean mamma, I know. My son would like to relax, eat a snack, and play Minecraft for a couple of hours (not happening) when he gets home from school. The problem with this scenario is that he does not want to go back to school mode. We have played this game before and no one wins. My son dallies around complaining and whining about doing homework until all hours of the night. My husband and I are frustrated with him because it would not take long if he would just DO the homework. So, when my son gets off the bus from school he does eat a snack. Then, it is time for homework. Guess what? He usually has his homework done in a few minutes with no hassle. Then my son has plenty of time to play outside with the neighbors, read a book, play a game for a little while, or whatever he wants to do before bedtime. The Organized Student has other simple but great ideas for filing school papers, planning for project due dates and much more. Click on this link to purchase The Organized Student by Donna Goldberg . It is available in paperback and Kindle. I am not being paid by the author to include her book in my blog post. I am only sharing a great resource with the author's permission. I hope that you can benefit from our family's school of hard knocks when it comes to all things related to organizing school work! If you implement any of these tips into your routine please send me a message to let me know how it works for you.